1st Edition 2015, 110 p, 1 Illus., 18 color Illus. This book explains how to use intravitreal steroids optimally in the management of patients with intraocular inflammation (uveitis) and macular edema. The rationale for this treatment approach is first explained by examining the pathophysiology of these disease entities, with particular attention to the major role of inflammatory processes. Devices for the delivery of steroids to the eye are discussed, and guidance provided on the role of imaging studies before, during, and after steroid therapy. The value of different steroidal approaches is then considered in detail. 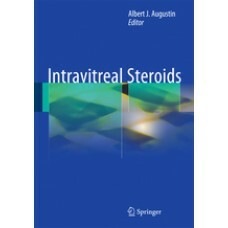 Other topics addressed include the use of steroids as a surgical adjunct and within a combination strategy. Uveitis and macular edema are common sight-threatening diseases or complications of diabetes and retinal vein occlusion for which no adequate treatment was available until recently. Both trainees and practitioners will find Intravitreal Steroids to be an invaluable aid in combating these blinding diseases.